Ilfracombe is a small seaside resort and harbour in north Devon, and is also not far from the upland coastal region of Exmoor. There are a number of small coves near to the town but the main tourist beach is 3 miles away at Woolacombe, which is large and flat and is very suitable for swimming and surfing. 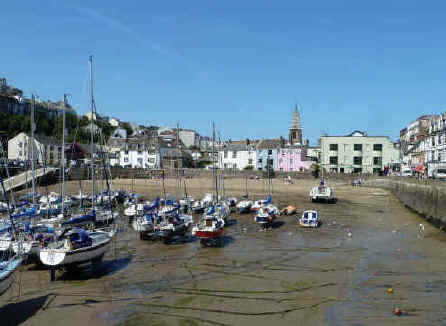 Ilfracombe is the largest harbour on the North Devon Coast - this natural harbour has a character and beauty unmatched in the Bristol Channel. The town has been in existence as a port for more than two hundred years and is today an ideal holiday centre from which to explore the many attractions in the surrounding area. The town has recently acquired a stunning new landmark - the Landmark Theatre and Pavilion which provide year round entertainment. The harbour area has also been redeveloped to provide for more berths for visiting boats as well as the locally based fishing fleet. Woolacombe is the main local beach for Ilfracombe and is one of the best bathing beaches in Devon. It is around 3 miles from the town centre and is easily reached by car. Woolacombe is a small tourist village with lots of accommodation of all sorts - it is just about entirely focused on the holiday trade. The main attraction is the two miles of golden sands and crystal clear water that make it an ideal beach for families. The beach is all sand and is gently sloping so that even toddlers can enter the water easily (with supervision of course). The beach also gets good surf and even in summer you can find a two to three foot waves. In winter months this can rise to 4 to 5 feet with the right conditions. Please note - it gets very busy in the summer and parking is pricey - but OK if you have a full car/ all day. Exmoor National Park is an unusual area in that it is part upland moor and part rugged cliff tops. The park straddles the Devon-Somerset boarder and offers a great deal to the visitor. 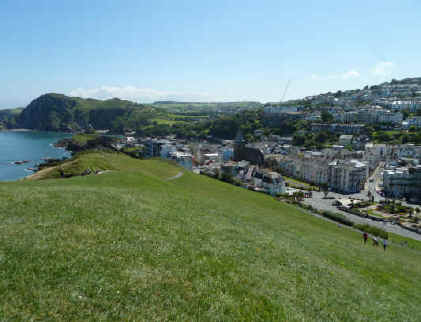 The coastal section is mostly cliff tops which rise up to 366 metres with breathtaking views of the Bristol Channel. In land there are gentle hills and many valleys the most famous of these areas being the Doone valley, the setting for the novel Lorna Doone, by R D Blackmore. The land rises steeply to form a plateau at Dunkery Beacon which is at a height of 520 meters. Within the wooded valleys can be seen Exmoor ponies, red deer and horned sheep while above you may see buzzards and kites. Lynton and Lynmouth are situated further along the coast from Ilfracombe and are within the Exmoor National Park. Lynton has most of the accommodation while Lynmouth has the harbour and seafront. A unique feature of these two towns is that they are linked by a water powered cliff railway so it is relatively easy to travel between the two towns. There is a rocky beach at Lynmouth plus a large grassed area and plenty of cafes and shops nearby to tempt you. 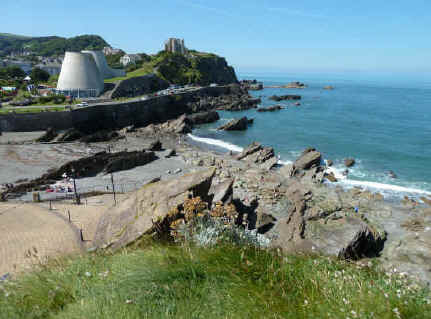 Tourist Information Centre - Landmark Theatre, The Seafront, Ilfracombe, Devon EX34 9BX Tel 01271 863001. Lundy Island - Book a trip on MS Oldenburg at the quay.